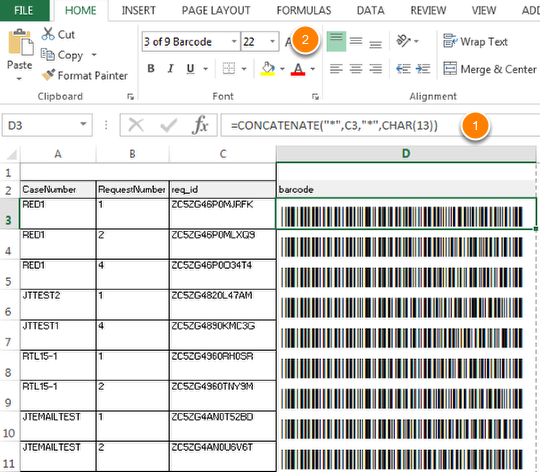 Building a Work list with Bar codes from a Query – Welcome to JusticeTrax Customer Care! Have you ever used the Ad Hoc Query Tool to get a list of requests then thought, "I wish this had barcodes so I could use this as a worklist?" Here are a few quick steps that will allow you to use that list in the Request Batch Update screen by adding a simple formula to an Excel spreadsheet. Use the Search > Ad Hoc Query menu option to build the list of requests you need. Export the the output to Excel. 1) In the Excel spreadsheet, include a column where the formula is =CONCATENATE("*",C3,"*",CHAR(13)) The C3 gets replaced with the cell value that contains the REQ_ID. The CHAR(13) is a return or enter expected by the bar code scanner. 2) Format the cell to use the 3 of 9 Bar code font. You may want to increase the font size so it scans easily. Test your list by scanning the bar codes into Notepad. 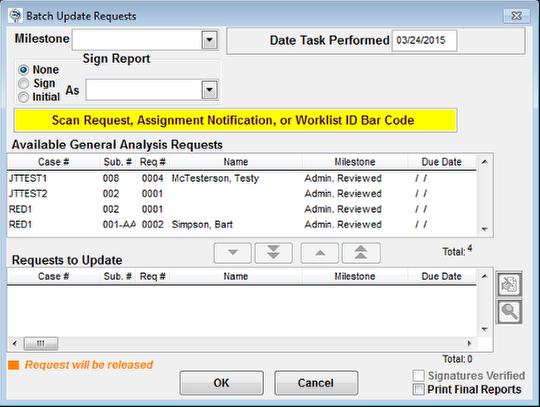 You can now use the printed output from your query to batch update the requests by scanning the bar codes.